I am still waiting for the delivery of The Farmer’s Wife. While browsing the book on Amazon, I did note the names of the blocks in the first chapter. The majority of the blocks in this book were published in the Kansas City Star newspaper over a period of years from the 1920’s to the 1940’s. Block Base software boasts that it has the complete collection of these blocks, so I clicked through my software and quickly found the two blocks featured in Chapter One: Cut Glass Dish and Kitchen Window Box. I decided to get started while I wait for my book. This is Cut Glass Dish. It is a six inch block and has 51 individual units in it. That’s right. 51. 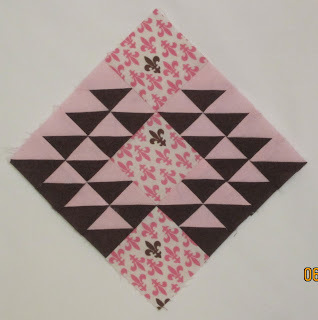 It took me four hours to sew this block (and I am not a beginner). I had to wonder about the author’s choice of this complicated block as the very first block in the book. Sewing this block has made me realize I need to decide on two things: block orientation (do I want the blocks on point, like this one, or set as a square; and I need to decide on a color scheme. 111 blocks is a lot of different blocks and a coordinated color scheme will help pull all the blocks together. 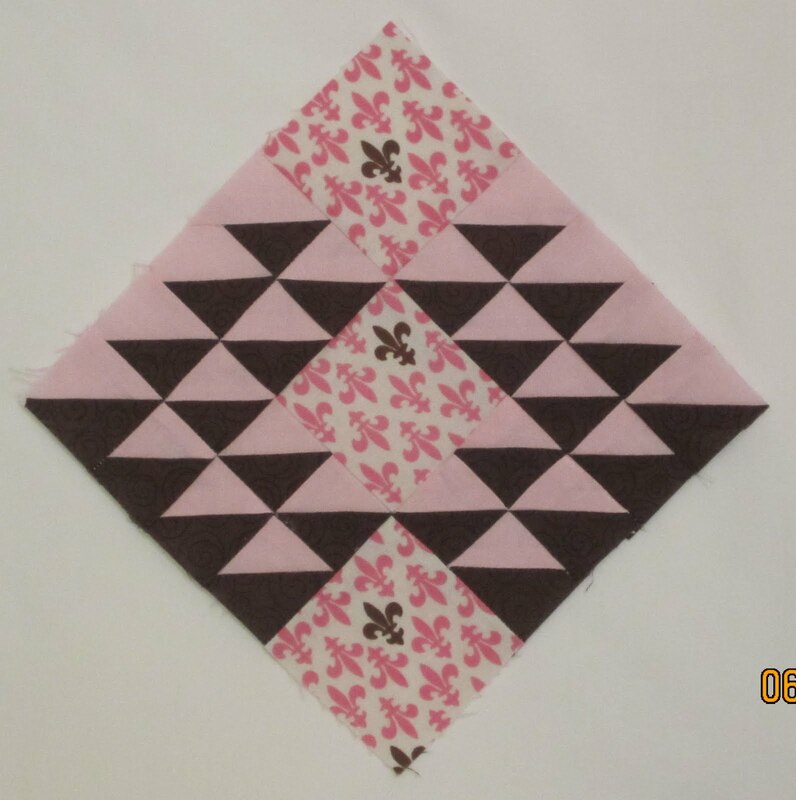 I can tell you that pink and chocolate brown are going to be in the mix, because there is no way I am doing this block again! 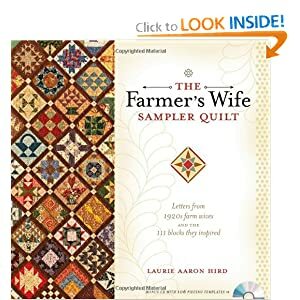 Farmer’s Wife Quilt – To commit or….not? I copied this graphic from Laurie Hird’s website so you could see an image of the quilt, but don’t “Click to Look” because nothing will happen! If you would like to see inside, go to Laurie’s site or to Amazon for a look. I promised myself I would not get hooked into another quilt along. Then I saw this one, and well….I am faltering. This book is based on letters from farm wives of the 1920’s, in answer to a magazine contest, answering the question “Would you want your daughter to marry a farmer?” I have read excerpts from the book and they are so compelling. So, yes, I did order the book today and look forward to reading it. 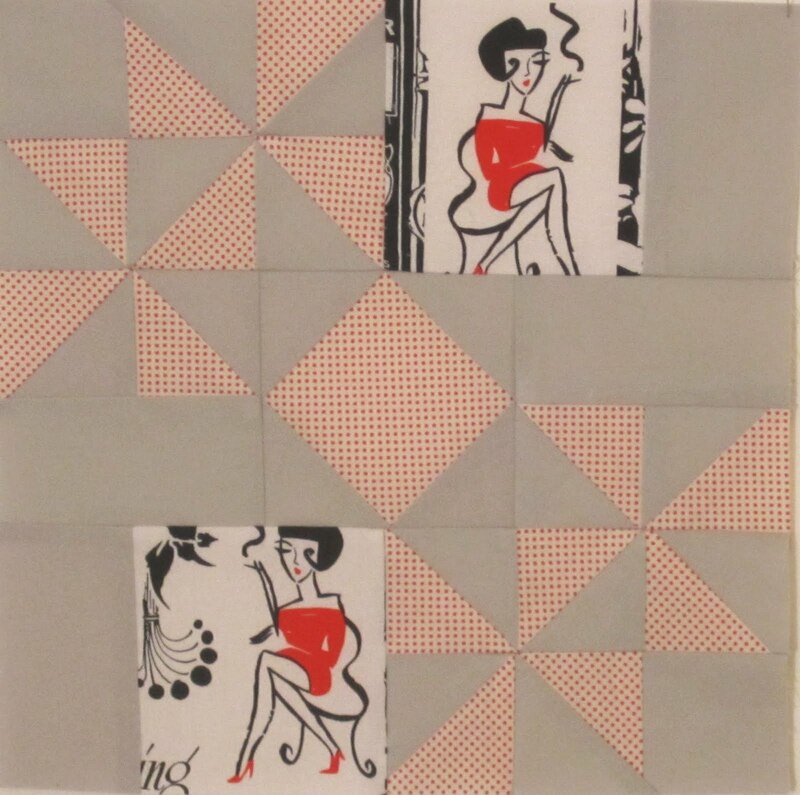 Will I commit to sewing 111 – 6 1/2 inch quilt blocks? “Every young girl should piece one quilt at least to carry away with her to her husband’s home, and if her lot happens to be cast among strangers, as is often the case, the quilt when she unfolds it will seem like the face of a familiar friend, and will bring up a whole host of memories, of mother, sister, friend, too sacred for us to intrude upon.” From “Beds, Bed Clothing and Bedmaking” written in 1888 by Annie Curd for Good Housekeeping. We live in a different world in 2011, but the art of quilt making still binds together a community of quilters who share a passion for preserving this amazing art form. I love the fun pinwheel shapes. 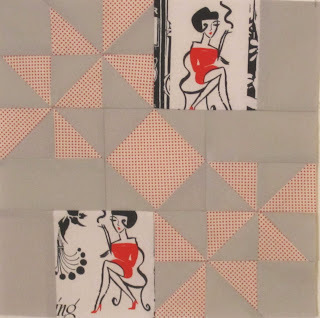 I am using Alice Kennedy’s “Newspaper” fabric for these blocks. It is a 1950’s themed print which explains the glamorous depiction of a woman smoking, which is not politically correct these days. California has such strict anti-smoking laws that you very rarely see someone smoking in public. I have been absent for over a month here in blogland. My youngest graduated high school last Friday and I was busy helping coordinate her grad night event. If you have ever helped build one of these amazing transformations, you know how much work it is! The kids had a great time and that is the end of my school volunteer career. A real milestone for a mom!